Client Spotlight: Thayers Natural Remedies at NPEW 2017 | Absolute Exhibits, Inc. The 37th annual Natural Products Expo West & Engredea (NPEW) is the world’s largest trade show for natural, organic and healthy lifestyle products. This year’s show was held on March 9-13 at the Anaheim Convention Center and drew in a record-breaking crowd of over 80,000 attendees and 3,100 exhibitors, including 500 first-time exhibitors, showcasing the latest products, packaging and services. For the past three years, Absolute Exhibits has had the privilege to work with Henry Thayer as its trade show partner for NPEW and other industry shows. Our team designed and constructed a unique custom exhibit purchase and have provided ongoing installation and dismantle (I&D) services. 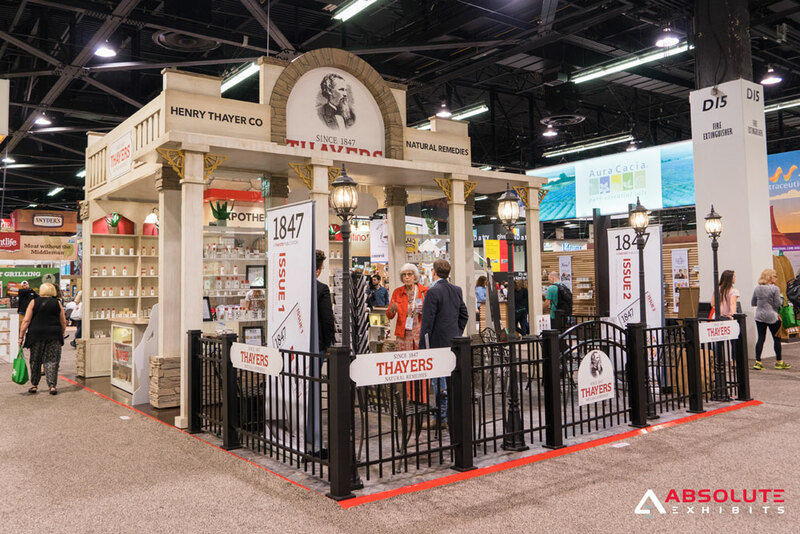 Learn more about the design process and inspiration behind Thayers’ vintage pharmacy-themed trade show exhibit. Established in 1847, Henry Thayer, also known as Thayers Natural Remedies or simply Thayers, is one of the oldest manufacturing companies in the United States. It specializes in natural personal care products that utilize time-tested witch hazel extracts and slippery elm remedies. Over the past 170 years, Thayer’s has become an industry leader and household name since its humble beginnings in a pharmaceutical laboratory in Cambridge, Massachusetts. Thayers approached Absolute Exhibits to design and build a custom 20×30 exhibit purchase. The challenge was to design a unique exhibit that could embody the company’s rich heritage while also maintaining a fresh look since the exhibit purchase would be used for several years. Our team worked intimately with Thayers throughout the design process to learn about the company, understand its objectives and ascertain its needs down to the finest detail. Given the company’s history, we were inspired to design an old-fashioned, vintage pharmacy as it perfectly fit the brand image and could provide a unique experience for attendees on the show floor. Thayer’s exhibit featured a number of period-specific design details to resemble a vintage pharmacy, such as a large marbeled counter, distressed wood flooring, custom decorative ceiling, exterior windows and 3D textured brick. Four (4) custom display units with recessed lighting and wrap-around shelving with lighting accents within the booth provided Thayers an abundant amount of space for product placement. Thayer’s later increased the booth size to a 20×30 and requested the addition of an 1800s style patio area (as shown in the renderings above and photos below). The patio featured new stone flooring, vintage street lamp posts, and rod iron furniture and fencing with a gate for visitor access. Thayers was exceedingly pleased with the exhibit and has received a great deal of positive feedback from attendees at both NPEW and NPEE (Natural Products Expo East). Our team will continue to provide I&D services for future shows. Contact us for more information about this project or to request a free quote for your next trade show display rental or purchase.